Yard Manager Julie Howard has been involved with horses for many years and holds the British Horse Society Intermediate (Level 4) Teaching Certificate, coaching riders grassroots level to those starting out in affiliated competition, whether it be dressage, show-jumping or eventing. The principles behind Julie's coaching philosophy are deeply rooted in improving partnerships, promoting willingness and harmony between horse and rider – to maximise the partnership, rather than create an unwilling servant in the horse. Julie's approach with clients is based on a mutual trust with correct horsemanship and thorough stable management, along with dedication and most of all FUN, to produce the right results. Private lessons cost £35 for 45 minutes. Semi-private riders (2 sharing) cost £25 per rider. There is currently a waiting list for weekend lessons and weekday lesson slots get booked up well in advance, please email for availability. NB. 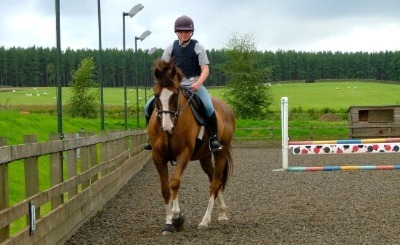 We are not a riding school with horses for hire but can suggest riding schools locally if this is what you require.